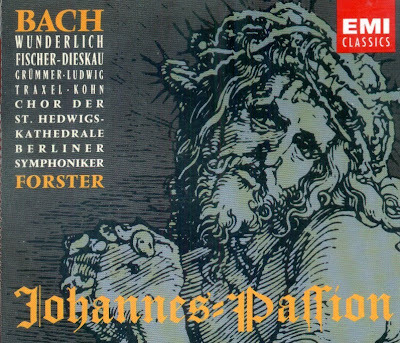 Bach's St John Passion, one of Christendom's most venerated works of art, initially had the function of an "audition piece", a sort of musical visiting-card, as it were. It was with this work that Bach presented his credentials to the Leipzig public on Good Friday, 1723: after a good deal of humiliating to-ing and fro-ing, he had just been appointed Kantor of St Thomas's Church. The composer then made changes and additions to the Passion for four more performances, which he directed himself. With the St John Passion, Bach placed colossal and unaccustomed demands on his Leipzig audience, on his colleagues and superiors alike. He broke away from the ranks of reputable, traditionally-minded Kantors and aspired to the status of a fifth Evangelist. Who knows whether the countless disagreements and squabbles that Bach - in no way an easy going or compliant man - was involved in during his years in Leipzig may not have been the result of this alarming first impression. It is certainly no surprise that the new Thomaskantor was officially requested right at the outset of his employment in Leipzig not to make his church music "theatrical" in character. Curiously enough, this condition was even included in an agreement that the Leipzig city fathers signed with one of the greatest composers in the history of music - naturally without the least idea of what they were doing. "Theatrical"? The entirely inappropriate word was surely the helpless attempt of some worried Leipzig councillor to rationalise the terror that Bach's immense expressive power struck into his contemporaries. For the St John Passion is certainly no meek and modest "handmaid of theology"; it is no restrained illustration of the Gospel account of the Passion, narrating the holy story with its eyes closed and piously underling important points. All this in undoubtedly part of the Musical setting of the Passion according to the Gospel of St. John. But the music goes far beyond this, reproducing the immensity of the Passion anew from its own resources. Right at the beginning, in the first eighteen bars of the G minor introduction, the events of the Passion assume musical form, embodying all the pain and suffering of mankind. The chromatic lines of the oboes and flutes give eloquent voice to distress and grief, as does the oppressive onward surge of the semiquavers in the strings. In the course of the harmonic development, which unfolds with a dark urgency, menacing chasms appear, and even the clear G minor of the choral entry, finally reached after long-drawn-out torment, is unable to overcome these grim overtones. The original meaning of the word "passion" is evident in every note. What's more, Bach does not adhere to the text "God our Lord, whose glory is resplendent in all lands" by composing a radiant glorification of our Lord God. On the contrary, a brooding melancholy pervades the entire movement, and the music seems to point less to specific emotions than to point the way across the abyss. Only reading between the lines do we find the self-assured mastery of the great composer who summoned up all his powers to do justice to the Passion of Our Lord and to show the people of Leipzig what he was capable of. The St John Passion is split into two parts. The first of these comes to an end with the chorale "Petrus, der nicht denkt zurück". After this, the sermon was given in St Thomas's Church, Leipzig, and then followed the second part of the oratorio. The text follows the Gospel according to St John for the most part, but at a number of points of particular musical or dramatic significance, the Gospel according to St. Matthew is cited instead. To the Gospel texts are added the arias, in which the individual soul reflects on the account of the Evangelist, sung by a tenor. The chorales can be understood as the reaction of the Christian congregation. In accordance with an age-old tradition, the words of Jesus are not, as one might suppose, sung by a tenor, but by a bass. As far as the aria texts and the choice of chorales is concerned, Bach stuck to the Brockes Passion: Jesus, Who was martyred and died for the sins of mankind, which was very well-known in the 18th century. It is not possible to ascertain the precise extent of Bach's own contribution of the texts. The St John Passion is about great events and great feelings: the modern-day listener who is prepared to listen attentively, who has the courage to open both mind and heart to Bach's sublime work, will benefit from it time and time again. The DCD was released by Emi Classics, P 1962/C 1992, (ADD). Emi Classics CMS 7642342.